Face Off In An EPIC Head-to-Head Dinosaur Battle! 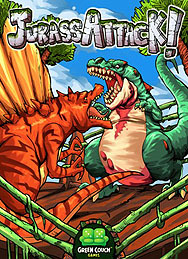 In this quick card game, each player chooses a dinosaur or pack of dinosaurs from their hand and compares their Ferocity. These prehistoric pugilists have their own special abilities, combo possibilities and varying score values to add to the tide of battle. A well-placed bluff or an intentional loss may provide an edge to victory in this game of subtle strategy and prehistoric pounding.